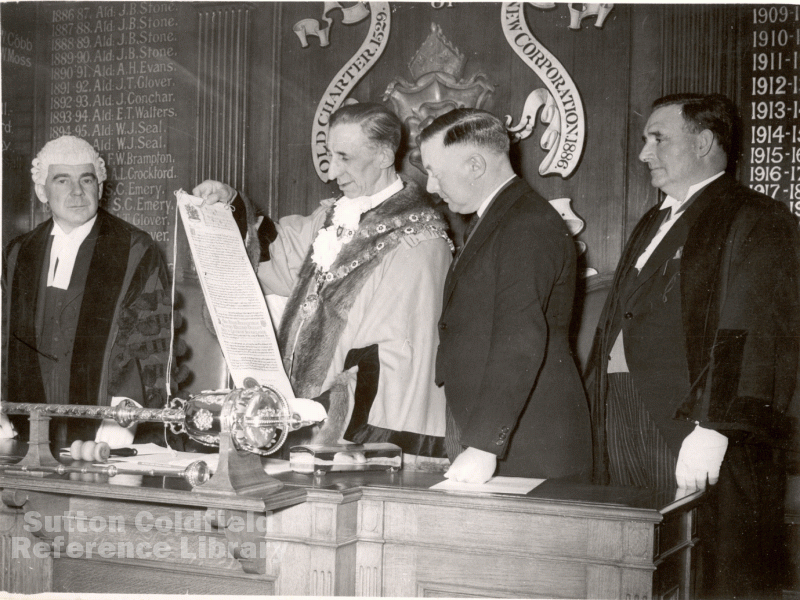 Sutton Coldfield used to have a High Steward. The office of High Steward of Sutton Coldfield was created by King Henry VIII in the 1528 Charter of Incorporation of the town. In addition to the governing body, known as the Warden and Society, the townsmen “may make, have and appoint…a fit person, learned in the law of the land, to be Steward of the said Warden and Society…to hold the Courts Leet and Views of Frankpledge”. The obvious choice for the first High Steward was Bishop Vesey, but there is no record of him holding the office, the first recorded High Steward, in 1547, being Sir John Throckmorton. The High Steward was a figurehead whose functions were mostly symbolic; he did not preside at the courts - in 1552, for example, the Court was held “before Thomas Lysley gentleman Warden and the Society there and Robert Edgeworth deputy for John Throckmorton Esquire High Steward there.” In 1612 the Earl of Essex was elected high Steward; he became, in 1642, the commander of the Parliamentary army in the Civil War, an enemy of the King. When King Charles II was restored to the throne he issued a new Charter to the town of Sutton in 1662, including the provision that no Steward or Deputy Steward be allowed to take office until the King’s approval had been given. It was the Deputy Steward, appointed by the High Steward, who acted as chief executive or Town Clerk of Sutton, and it was customary for a new High Steward to reappoint the existing deputy. In the eighteenth century the High Stewardship was held by four successive Lord Middletons followed by Lord Weymouth and the Earl of Aylesford, and William Homer served as Deputy Steward under at least four of these. For example, at a meeting of the Warden and Society on December 27th 1796 “The Right Honorable the Earl of Aylesford was unanimously elected into the office of High Steward of this corporation in place of the Right Honorable the Marquis of Bath deceased” and “the Warden and Society recommend to his lordship William Homer as Deputy Steward”. In his History of Sutton Coldfield, 1890, Riland Bedford remarked on a more business-like attitude in the town in 1810, when Mr. Homer “had brought his sleepy tenure of office to an end”. Messrs. Croxall and Holbeche, solicitors, became the next Deputy Steward. The Corporation was more dynamic in the 1820s, and some members resented the way that Mr. Nicholson (Warden in 1818 and 1819) and Thomas Holbeche the Deputy Steward seemed to control the business of the Warden and Society. A group of four, George Brown (Warden in 1833-4), Charles Barker (Headmaster of the Grammar School and Warden in 1836-7), the Rev. W.R.Bedford (Warden in 1822) and S.F.S.Perkins (Warden in 1804), plotted the overthrow of Nicholson and Holbeche in 1835 when the High Streward, the fourth Lord Middleton, died. Thomas’s daughter, Sarah Holbeche wrote about it in her “Diary”: “1835 Mr. Holden left Wylde Green but was yet on the corporation and thus foiled the intrigue of Messrs. Bedford Barker and Brown and Perkins to get Mr. Perkins elected Lord High Steward instead of Lord Aylesford, whereby Mr. William Perkins would have been Deputy…the three big Bs beaten - we never had such an excitement”. The letter from the fifth Lord Aylesford accepting the office and appointing Holbeche and Willoughby as Deputy Steward was copied into the minute book, along with copies of letters from King William IV giving his approval. High Stewards continued to be appointed even after the new Borough Charter of 1886, the last one being Lord Leigh of Stoneleigh, but the office disappeared with the extinction of Sutton Corporation in 1974.